With the US withdrawing from Paris climate agreement, it will be very difficult to keep the temperature below 2 degree Celsius by the end of the 21st century. There is a very high possibility now that the world is heading towards the temperature rise of more than 2°C. The UNEP Emission Gap report, 2016 clearly says that the predicted 2030 emissions will, even if the Paris Agreement pledges are fully implemented by all countries, place the world on track for a temperature rise of 2.9 to 3.4oC this century. Withdrawal of the major GHG emitter (US) means any action to combat climate change under the Paris Agreement will be insufficient by a huge margin and it is highly likely that temperature will increase significantly. The report projected an increase in both mean and extreme precipitation in the summer monsoon and subsequent increase in the number of monsoon break days. Floods and droughts are likely to increase in India since there will be a decline in seasonal rainfall, coupled with increase in extreme precipitation during monsoon. It is likely that tropical cyclone-related rainfall rates will increase with greenhouse warming. An increase in mean tropical cyclone maximum wind speed is likely, although increases may not occur in all tropical regions. In the Indo-Gangetic Plains, a changing climate is likely to reduce monsoon sorghum grain yield in India by 2-14 per cent by 2020, with worsening yields by 2050 and 2080. There shall also be alterations in rice yields as the process of rice development accelerates and reduces the duration of growth due to rising temperatures. Large reductions in wheat production in the Indo-Gangetic plains are also projected. On the east coast of India, clusters of districts with poor infrastructure and demographic development are also the regions of maximum vulnerability. Hence, extreme events are expected to be more catastrophic in nature for the people living in these districts. Food production in India is sensitive to climate change like variations in temperature and monsoon rainfall. Rise in temperature has a direct impact on the Rabi crop and every 1°C rise will reduce wheat production by 4 to 5 million tonnes. Every small change in temperature and rainfall has significant effect on the quality and quantity of fruits, vegetables, tea, coffee, basmati rice and aromatic and medicinal plants. According to World Bank report “Turn Down the Heat II: Climate Extremes, Regional Impacts, and the Case for Resilience” released in June, 2013, an expected 2°C rise in the world’s average temperature in the next decades will make India’s summer monsoon highly unpredictable. The report stated that shifting rain pattern will leave some areas under water and others without water for power generation, irrigation and in some cases even for drinking. It warned that by the 2040s India will see a significant reduction in crop yields because of extreme heat. Reduced water availability due to changes in precipitation levels and falling groundwater tables are likely to aggravate the situation in India where groundwater resources are already at a critical level and about 15 per cent of the country’s groundwater tables are overexploited. In India, more than 60 per cent of the crop area is rain-fed, making it highly vulnerable to climate-induced changes in precipitation patterns. It is estimated that by the 2050s, water for agricultural production in the river basins of the Indus, Ganges and Brahmaputra will reduce further and may impact food adequacy for some 63 million people. Enhanced frequency and duration of extreme weather events like flood, drought, cyclone, cold and heat wave may adversely affect agricultural productivity.Climate change is projected to reduce irrigated rice yields by four per cent in 2025 scenario. Rain-fed rice yields in India to reduce by six per cent in 2025 and less than 2.5 per cent in 2050 and 2080 scenarios. Wheat yield in India would reduce by six to 23 per cent by 2025 and 2050 scenarios. Yield would be reduced in areas with mean seasonal maximum and minimum temperatures more than 27 and 13°C respectively. Adjusting the time of sowing may be a practical low-cost adaptation. Mustard yield is projected to reduce by two per cent in 2025. Yield is projected to reduce in regions with current mean seasonal temperature regime above 25/10°C during crop growth. The potato crop duration in the Indo-Gangetic plains is projected to decrease and yield is to reduce by 2.5, 6 and 11 per cent in 2025, 2050 and 2080 respectively. Maize yield in kharif season is projected to decrease by 18 per cent. Rain-fed sorghum yield is projected to reduce by 2.5 per cent in 2025. However, rise in temperature may decrease cold waves and frost events leading to reduced frost damage to frost-sensitive crops like chickpea, mustard, potato and other vegetables in northern India. 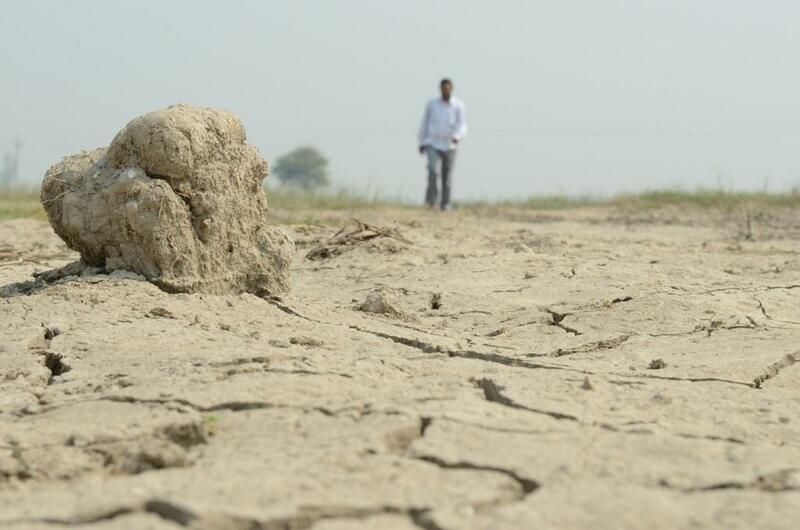 Being already vulnerable to climate change, news of projected increase in temperature beyond 2°C will be particularly bad for the farming community in India, which is already passing through severe stress. -- Trump's action will have no impact on India except getting share in green fund under Paris agreement. -- Deccan Chronicle 20 June 2013 published the report of World Bank "Turn Down the Heat: ----" and below this report also published my response "To much heat over global warming"
-- We are wasting 40 to 50% of the food and the natural resources used to produce that is wasted in India -- [I presented in all india radio in 2011 and finance minister in his budget speech in 2011 and FAO reported it as 30% globally. -- In agriculture production the main player is rainfall. Even IPCC agreed that no impact on rainfall by the so-called global warming. However, natural variability in rainfall plays significant role -- which I published as back as 1993 in a book form]. Extremes are part of this.